THIS WAS THE GREATEST ALLIED POW ESCAPE OF WWII, with 250 American servicemen escaping their Nazi jailers. The story opens in the stinking latrines of the Schubin camp as an American and a Canadian lead the digging of a tunnel which enabled a break involving 36 prisoners of war (POWs). The Germans then converted the camp to Oflag 64, to exclusively hold US Army officers, with more than 1500 Americans ultimately housed there. Plucky Americans attempted a variety of escapes until January, 1945, only to be thwarted every time. Then, with the Red Army advancing closer every day, camp commandant Colonel Fritz Schneider received orders from Berlin to march his prisoners west. Game on! Over the next few days, 250 US Army officers would succeed in escaping east to link up with the Russians - although they would prove almost as dangerous as the Nazis - only to be ordered once they arrived back in the United States not to talk about their adventures. Within months, General Patton would launch a bloody bid to rescue the remaining Schubin Americans. In The Big Break, this previously untold story follows POWs including General Eisenhower's personal aide, General Patton's son-in-law, and Ernest Hemingway's eldest son as they struggled to be free. 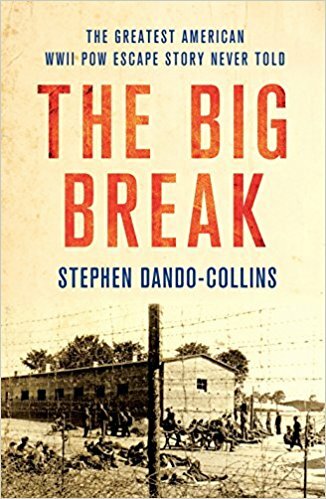 Military historian and Paul Brickhill biographer Stephen Dando-Collins expertly chronicles this gripping story of Americans determined to be free, brave Poles risking their lives to help them, and dogmatic Nazis determined to stop them. Now also available in Italian and Dutch editions.